A notable 50-year anniversary passed by this week with not even a whisper. 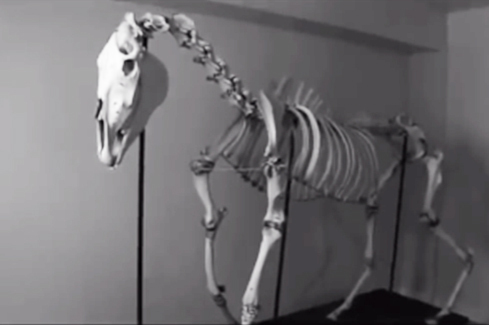 Anniversaries of the weird and the macabre are not normally celebrated, but in this case, I thought it was appropriate to revisit one of the most perplexing and iconic unsolved mysteries of all times: The “Snippy the Horse” case. The most well-known unexplained livestock death ever reported, the so-called “Snippy the Horse” case is considered to be the first widely publicized unexplained livestock death. 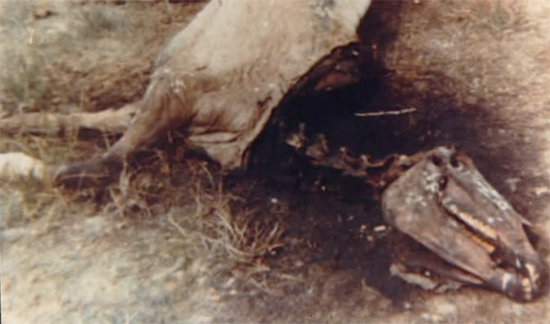 The horse probably died (or was killed) and disfigured on the night of September 7th, 1967. Peripheral to the case were the dozens of UFO sightings that were also reported during that eventful fall that have inexorably linked mysterious livestock deaths with the UFO phenomenon. The “Snippy Case,” has become a thing of legend among paranormal enthusiasts and in the two months following the horse’s unfortunately horrific demise, the news item was picked up by the wire services and it became a sensational international news story. Reporters from as far away as England, France, Germany joined North American journalists at the site in the San Luis Valley during that fall 50-years ago. The site attracted the curious who flocked to the remote King Ranch location by the hundreds. Today, if you gaze down on the meadow where the horse lay that Fall of 1967, on Google Earth, you can still see the hardened dirt path that led out to the location—a quarter-mile west of county road 150. I am indebted to David Perkins and the late Tom “Godfather of Mutology” Adams for much of my research into this iconic case. First a little history and some background on the location and the principles involved: The case occurred in south-central Colorado’s San Luis Valley. I spent 13 years there—much of my time was spent investigating current reports and researching the regions’ colorful history. The SLV is the world’s largest alpine valley and the valley floor sits at over 7,000 in elevation. Completely surrounded by mountains—some that rise to over 14,000-feet—I consider this remote, majestic region to be a perfect cultural petrié dish of sociological study. Isolated physically and culturally from the culture-at-large, the SLV is the subject of my first three books, The Mysterious Valley, Enter the Valley, and Secrets of the Mysterious Valley. The Mormon Urraca pioneers settled the western slope of the 14,000-foot Blanca Massif (which dominates the mid-eastern part of the SLV) in the late 1870s and one of those hardy families was the Kings, who homesteaded a 2,000-acre cattle ranch that extended down from the foot of the mountains out onto the valley floor. The upper ranch had a small cabin on the original homestead site and the main ranch house was located five miles away out in the valley, ten miles southeast of the Great Sand Dunes. The King Ranch sat on some of the earliest meadows known to have been visited by humans in the lower 48 states. The Kings were a hard-working cattle family, putting in long hours sun-up to sun-down in one of the valley’s most picturesque areas. Eighty-five-year-old widow Agnes King was the King Family matriarch and she lived with her two sons, Harry and Ben and a daughter named Nellie. Ben King was a self-styled mountain man who could identify every animal and plant in the San Luis Valley and name every creek that flowed down the western slope of the Sangres. Harry was the King Ranch boss, running cattle and tending to the ranch’s daily affairs. Nellie, married to Iowa native Berle Lewis, lived with her husband in the cabin on the upper ranch. The Kings and Lewis were truly salt-of-the-earth ranchers with a documented family history of witnessing unusual celestial events, i.e., sighting by C.M. Lewis, Agnes’ deceased husband, of the spectacular Alamosa Aereolite strike in the fall of 1898 on the Baca Ranch—about 20 miles north of the Snippy site. Here is what we know about the demise of the horse dubbed by the press as “Snippy.” It was a blustery morning, September 8, 1967, and Harry King noticed that only two of their three horses were outside waiting for grain and water. Thinking this unusual, he headed out to feed them. He claimed later that he had sensed something was wrong and he was right: Lady, Nellie’s three-year-old young mare, was nowhere to be found. After waiting until the following morning for her to show up, Harry went searching for the missing horse. After an hour, he spotted something laying in a meadow a quarter-mile north of the main ranch house and it raised the hair on his neck. Lady’s corpse was missing all the tissue from her shoulders to the tip of her nose, the exposed bones glistening, bleached white, like they had been in the desert sun for years. The flesh, muscles, tendons, meat and hide were missing from the tip of the nose to a wide circular cut just above the horses’ shoulders. Atypical, no other case to my knowledge before, or since, has featured this description of complete cranial and neck disfigurement. 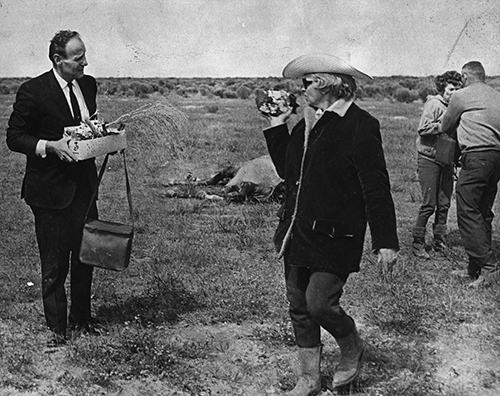 According to Berle Lewis, the skull and neck bones were “as white a sheet of paper…as if they’d laid out in the desert sun 30-years.” The animal lay on its left side, facing east in a damp meadow located about one-quarter-mile west of Road 150, a two-lane, heavily traveled dirt road that went north another six or so miles to the Great Sand Dunes National Monument. There were no scavenger or predator tracks, bird-droppings or evidence of how the horse had died and then was subsequently disfigured. Over the next month or so the bones began to turn a rosy pink color and the bleached white appearance faded. This is the time frame when the most famous photographs of Snippy were snapped. It had rained off an on during the first week of September and the ground was still soft and muddy in places. This made ascertaining track evidence relatively easy. Harry King determined that the three horses had been running full speed headed southeast toward the ranch house and Lady had been “cut from the herd,” then veered away from the other two, who continued on toward the house. Lady’s tracks continued galloping for several hundred yards, by King’s estimate, where they then inexplicably stopped in full gallop. Ii is interesting to note that the “official” story diverges at this point into two distinct versions. Version one is supported by several newspaper articles; Coral Lorenzen’s Fate article and Berle Lewis’ account. It says the carcass was found over 100 feet farther along the meadow. 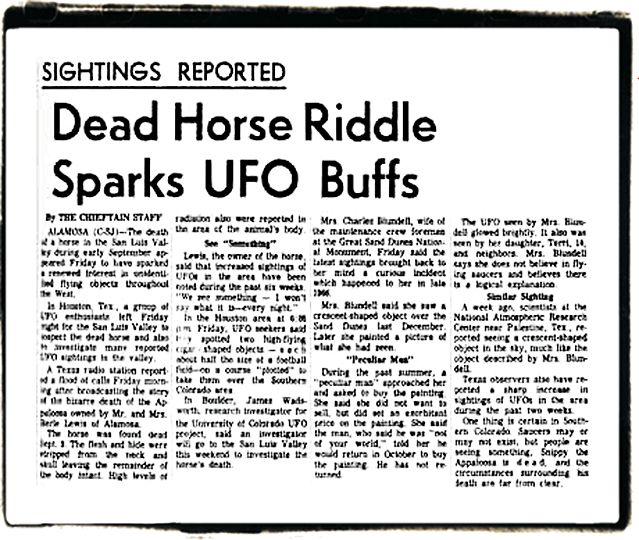 Version two, supported by several articles and Don Richmond’s original Aerial Phenomenon Research Organization’s (APRO) investigation, stated that the tracks went in a tight circle several times, like something was circling around the horse, and that the corpse was found only 20 feet away from Lady’s circling tracks. This discrepancy has never been resolved one way or another to my knowledge. A careful examination of the area a week later by Nellie, Harry, Berle and friends, found what appeared to be four burned areas in the ground at four, nine, 13 and 21-feet away from the carcass to the northwest. Shaped like an upside-down question mark, the burn marks in the ground were found to the southeast ranging 40 to 50 feet from the body. Five 18-inch-wide, by 8-inch-deep “giant horse tracks” were punched into the ground and were found among some flattened appearing chico bushes located near the body. Nellie called Alamosa County Sheriff Ben Phillips to report the strange death of her horse. Phillips immediately upon hearing the description branded the horse’s death a “lightning strike” and didn’t bother to drive out to the scene to investigate. He later admitted that it was odd that the horse had no evidence of burn-marks usually associated with a lightning strike. Nellie and the rest of the family, however, were convinced that something highly irregular had happened to her horse. She was well aware of the several UFO sightings in the weeks prior to her horse’s demise and she and Berle, and close friends, had experienced sightings that previous spring. 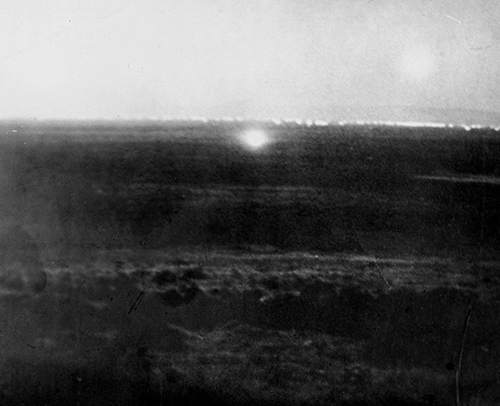 Large, Unidentified light over the Dry Lakes, south of Snippy site. Nocturnal lights proved extremely elusive but more photographs were captured during the fall of ’67. In October, two college students from Pueblo, Colorado, Bill McPhedries and a friend, with the help of APRO investigator, Don Richmond, photographed mysterious lights over the Great Sand Dunes as they stood on the porch of the Lewis cabin, high above the valley floor. They had first noticed them in the Dry Lakes area, five miles due west of their vantage point. They seemed to hover close to the ground before flying off toward the dunes—passing just to the west of the Snippy site. Brilliant white and red, they seemed to the three observers to be under intelligent control. The photographs appeared in the Pueblo Chieftain along with a story by Pearl Nicholas. Nellie was positive the strange lights and objects she and others had seen, and reported, were somehow involved. I have noted many of these San Luis Valley, CO reports in my ’Mysterious Valley’ books that didn’t garner the same attention as Snippy’s death. But, at the end of the first week of October 1967, Nellie’s longtime friend Pearl Mellon Nicholas, society editor for the Valley Courier let the strange death of the horse out of the barn. During the next four weeks, the “Snippy” the horse story emerged quickly from the local to the regional, national and international newspaper press. On March 12, 1993, I down with Berle Lewis, Nellie’s husband, for a video tape interview when he agreed to meet with me at the Great Sand Dunes Country Club maintenance shop where he worked. This was my first full-length video interview conducted for my first book, The Mysterious Valley and is the only full-length interview conducted with him. I found him to be very credible and matter-of-fact—a straight shooter and was immediately struck by his colorful, casually humorous demeanor. This was offset by the honest and matter-of-fact way he described many unusual and some downright unbelievable stories from the late 1960s. “Berle, when did you first start hearing about UFOs and strange lights being seen around here?” I began. “You might say the backyard, it happened right out back of the house.” Berle laughed. “We had no idea what caused it because I know nobody with a knife could cut that meat so smooth and nobody could ever take the meat off the bones where it was as white as that piece of paper over there. Now I don’t give a darn who you are, there’s not a butcher of any kind that can make that bone look like it’s sat there for years! The eyeballs were gone, the tongue was gone, the esophagus was gone, and the windpipe was gone. All the hair, the mane hair and hide on the neck, clear down to where the collar fit. But that cut, completely around, was smooth! It’s just impossible to cut it that way!” I inquired about the smell. “Did he ever have a vet look at it? I was impressed by Berle’s amazing recall of the events that had taken place over 25 years before. I asked him why his wife Nellie told reporters she was convinced that flying saucers had killed her horse. The Lewis’ were initially reluctant to go public with the story. Word about the case spread like wildfire locally during the first three weeks after the horses discovery, and curious locals began showing up at the site. Initially, Harry tried to confine the visitors to a small area near the body to maintain the integrity of the scene, but this proved impossible as first dozens and then hundreds of onlookers made the trek out to the meadow to see the horse. It seemed to [Nellie] like some kind of high technology had done it, rather than something someone could pull off as a prank. I didn’t think it was a prank. I don’t see how something could be done that precisely, to use precision to cut the flesh and the esophagus; take the spinal cord without damaging the bones. It just seems like something out of this world. The extent of the “flap” of 1967 through 1969’s UFO, military and mute activity in the San Luis Valley and elsewhere has become blurred through time. 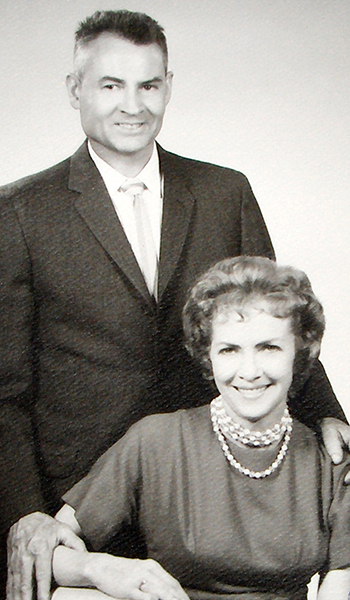 I tried for years to gain access to Valley Courier editor Pearl Nicholas’ extensive listing of UFO reports from the 1967-1970 time periods when hundreds of sightings occurred, but surviving family members have resisted my requests for access. As a result, a vast majority of these strange events have become lost effectively beyond our reach, surviving within word-of-mouth tales and family legends. Facts have been mixed-up, added upon, deleted, forgotten and inexorably altered. Even the primary eyewitnesses, who should be able to effectively clarify the events they witnessed, may have contributed inadvertently to creation of mythos, folklore or a cultural meme by their fuzzy recollection of these unusual events. As late Fall of ‘67 word of the Snippy case faded in the culture, it was replaced by a bucolic glow brought on by a rapidly changing culture tuning in turning on and dropping acid. The baby boomers were being awakened to new possibilities, the Beatles were recording Magical Mystery Tour, and a contentious US presidential election of 1968 was heating up as a meat-grinder war was being escalated in SE Asia. And cattle and other animals continued to be reported as “mutilated.” By 1975 cases were being reported nightly across the Mid-West and Rocky Mountain states, and 50-years later, no one has convincingly explained who or what has been perpetrating tens-of-thousands of livestock deaths on grazing lands around the world. Interesting, because Dec 31, 1968 we had a colt killed and our horses terrified. The colt was in the center of a corral with no access and it busted through fencing to get there. It had been snowing and there was no blood around the corpse. The chest cavity was open and the lungs and heart was gone. The rib cage looked like it was cut open and the outer part of the chest was gone. There were absolutely no tracks around the body in the snow except for the colts tracks. The other horses refused to come back to this area for over two weeks. As it was early afternoon and I could see completely around me, I had the feeling of dread and foreboding, I felt I was being watched. This took place in Indiana. Never found any answers and the police refused to check it out. Where in Indiana did this occur? The first time I heard about Snippy, someone said that it really was a mare, and reporter made a mistake with name after horse’s owner told him that it’s father’s name was Snippy. Real name–Lucy. (what I recollect). Strange valley-camped out many summers near Lake Platoro. Shirley McLaine had a UFO observation Platform around Crestone, Colo.